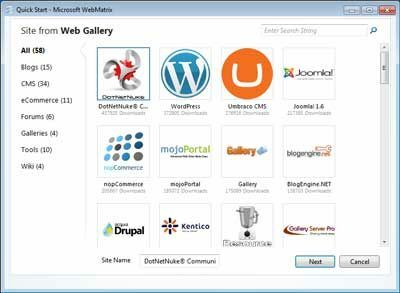 By choosing the WordPress framework, for example, WebMatrix will install and configure a fully working WordPress site running locally. The intention is that you’d put your site together on your PC and then upload it to a compatible host using Microsoft’s Web Deploy technology, but I haven’t yet had time to find out if that works in practice. Of more use, perhaps, is the sheer simplicity of being able to create multiple WordPress sites for developing themes and plugins, or testing new code before deploying by hand to your live site. 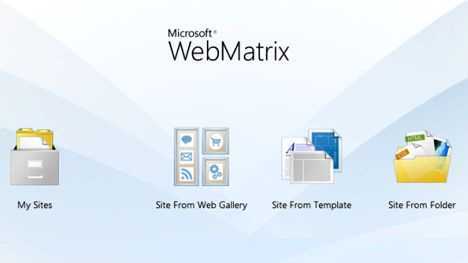 None of this was impossible before using other tools, but WebMatrix makes it more convenient. Choosing WordPress or Drupal for the first time will cause WebMatrix to download the underlying PHP and MySQL technologies as well as the chosen framework. This caused a major problem for me because WebMatrix couldn’t get the MySQL download to successfully complete. The workaround was to download it from within a browser – choose mysql-5.1.53-win32.msi. The end result is a fully working WordPress installation with the underlying files and database accessible from the WebMatrix control panel – yes, you can even edit a MySQL database this way. Deployment is more problematic. The FTP method built into WebMatrix doesn’t upload the database, so the only answer would be to manually create a WordPress installation on your server with identical details. Microsoft’s Web Deploy function looks fiddly and typically idiosyncratic – hosting providers need to change their systems in order to work with it. This may prove to be the Achilles heel of WebMatrix. Overall, a promising technology. I can see a potential use as a testbed for plugin and theme development in WordPress, Drupal and other frameworks. 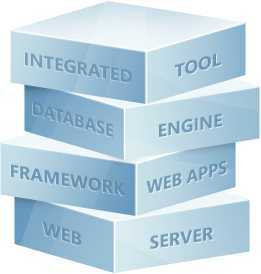 It remains to be seen whether the final step in integrating with web hosts proves to be a problem, but it could well be a good way for newcomers to .NET technologies for the web to get started with the minimum of fuss and no financial outlay. Let’s just hope Microsoft don’t drop it again.